Our newest in King’s tables! 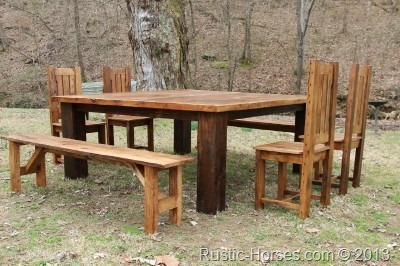 This one in a 6 x 6 size, with 4 chairs and 2 benches. With the King’s style chunky thick top and big corner post legs. This is a great look. You have beautiful items. I would be interested to know what your pricing is on some of the items. 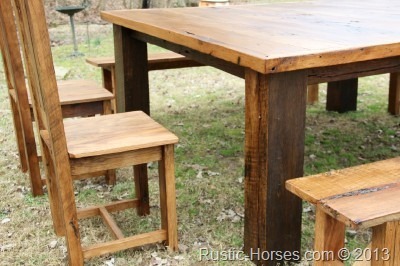 I’m most interested in the “Square Kings Table” and chair set shown on your site. We live in East TN and would be able to pick it up ourselves. Moving in to a new home and would love to fill it with this style of furnishings. HI! I LOVE this square kings table! Would you be so kind to email me the cost of the set and also how many people fit on the benches? Two or three adults? Four kids? We have a big family. 🙂 Thank you! By the way a friend told me about y’all. Hi Laura, those are 4 -6 ft benches, so on each bench, comfortably 2-3 adults or 3-4 youth or children more if you want to get cozy. 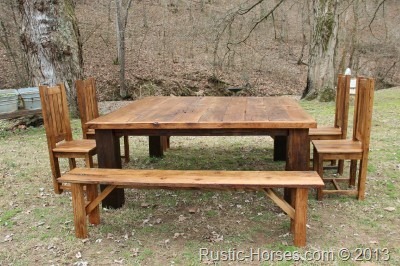 $1895 for the set (with all benches) in a 4 x 4 size or $2095 in a 6 x 6 size.